WHAT IS THE 1 THING ALL THESE ATHLETES HAVE IN COMMON? Over the past 6 years, I've made it a personal mission to dig deep into the science of the vertical jump. My goal was to find what actually worked for developing elite vertical power. HARNESSING THE POWER OF THE "VERTICAL RELEASE"
Everyone has the innate power to develop an impressive vertical jump that would EXCITE even the toughest scout. Your body has a protective mechanism within the muscles called the Golgi Tendon Organs (or GTO for short). And these GTO's act like an anchor to your vertical jump ability. Golgi tendons sense changes in muscular tension. The protective mechanism is your body's way of keeping your muscle's from getting strained or injured. EVEN at the risk of exposing themselves to greater chance of injury. It can be used by anyone regardless their height, weight, or gender to seamlessly add inches to your vertical. What makes "Vert Release" so special is not only does it train to decrease the inhibitory effect of the GTO but it nails the additional 4 steps responsible for an explosive vertical jump... all at the same time. The Stretch Reflex is when your muscle contracts in response to being stretched. Remember those GTO's I was talking about? The same that shut the muscle down when it senses too much force? In the same sense it feels it is in danger of injury. If you want to gain a higher vertical jump you MUST focus on decreasing the effect of the GTO's while maximizing the excitement effect of the Muscle Spindles. Both of these mechanisms combined make up the "STRETCH REFLEX"
The "Stretch Shortening Cycle" (SSC) acts like a slingshot within your muscle.. When a muscle lengthens, it builds up elastic energy...think like a rubber band. The sequence of lengthening, building-up, and releasing in itself is responsible for an impressive vertical jump. Motor Unit Recruitment is a measure of how many motor neurons are activated in a particular muscle, and therefore is a measure of how many muscle fibers of that muscle are activated. The higher the recruitment the stronger the muscle contraction. In the past athletes have tried a variety of different methods in an attempt to increase their motor unit recruitment with little to no success. In recent years, we have discovered the best way to increase motor unit recruitment is to spend a significant amount of time strengthening the muscles at their isometric phase in correlation to the specific range of motion they utilize in competition. And display the explosive power throughout the entire movement. Speeding up your Rate of Force Development. Rate of Force Development (RFD) relates to how quickly you generate muscular force. It is determined by how fast your muscle fibers are recruited, activated, and synchronized to perform a movement. The key to increasing RFD is to generate as much force as possible at the beginning of a muscular movement before the Stretch Shortening Cycle comes in and robs the muscle of that potential energy. The Flight System is the first jump training system which takes the 4 steps of vertical jump mastery and combines them into one step-by-step approach to progressively adding inches to your vertical jump. How to structure your training to guarantee you 3x your vertical jump within a matter of weeks. The thing most athletes do in their training to attempt to increase their vertical jump, which actually suppresses any chance they have to EVER jump higher. 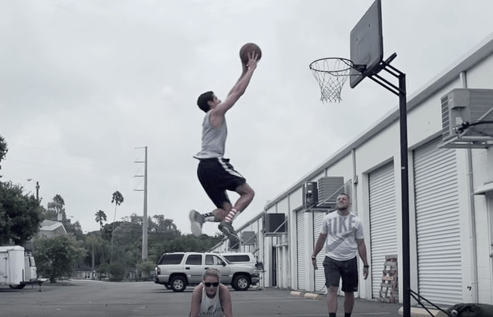 A simple trick to use to instantly gain inches on your vertical jump. The 3 jump training mistakes made by nearly every athlete.... and they aren't even aware of. Plyometric exercises that literally force your body to have the effortless spring of guys like Aaron Gordon, Andrew Wiggins, and Zach Levine. Exactly how to pinpoint your vertical "sticking" points, break them down and translate them into explosiveness. The one thing you can do 5 minutes before a game to ensure you increase your vertical power. The key mobilization and activation drills prior to your training that alone will increase your vertical in your training. Key drills to build explosive single leg strength to effortlessly explode mid-stride...which is crucial for making highlight reel plays. How to translate your new vertical power to become shifty-as-hell in the game and exploit defenders. Develop the split-second reactive ability that separates college from pro players. Unveil the coveted single leg "pop" the best jumpers have...this is the "it" factor all teams are looking for from a physical perspective. I tested out in Spring Training with a 29″ Vertical and in just one short off-season with Chris, I was able to retest this past season at a 36.5″. It literally turned heads of the entire Yankee organization with that increase in one season. I picked up a basketball in 9th grade and being so late in the game I never thought I would play at a higher level, let alone see the court on my high school team. From not touching the rim to dunking in games junior year, Chris’s vertical program gave me one edge while I thoroughly learned the game. Having explosive vertical power translated into every aspect on the court. For real, I didn’t think I was going to reach my goal of dunking in high school. I tried 3 other trainers in our area before I linked up with Chris. The rest is history, with every single month I was gaining inches until I was able to punch it in almost every game senior year. Getting ready for the combine some scouts place a heavy emphasis on your explosive power. Not only did I hit PR’s in the vertical in 3 months but I did it while gaining 12 lbs of muscle through this program. Listen, I've been around long enough to realize the internet's full of personal trainers and strength training guru's making big promises. Which is why I've done my best to alleviate any concerns you might be having. When you invest in The Flight System today, you can rest assured knowing it's backed by my 60-Day Money Back Guarantee. Simply shoot me a personal email at overtimeathletes2@gmail.com and we'll refund your entire investment, no questions asked. but that doesn’t mean you can’t play at your highest level. Do your future self a favor and commit to your Vertical Jump Mastery today. Add inches to your vertical jump within the next few weeks… and become that player scouts say came out of nowhere… the same players they are now forced to pay attention to. Earn the respect of the other top prospects in your division... so much so they gear up to play against you when the time comes.